Had a terrific experience with a cigar today, that I kept putting off because of the size. Thanks ENFIDL for giving this to me. It was a Trinidad Churchill Maduro. I kept avoiding it because I thought I would not have time in the morning to smoke it. I had it with some H20. It had a soft leathery feel to it. I used my Xi3 Redwood to cut it and Xikar Exodus to light it. It was medium in strength which was very pleasing to know. I really thought this was going to rock me this morning. 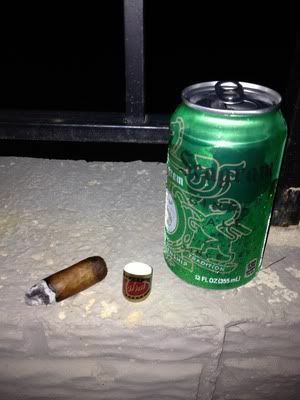 But that's not the make shift of this cigar. Started smoking it at 0545 and it ended at 0715. 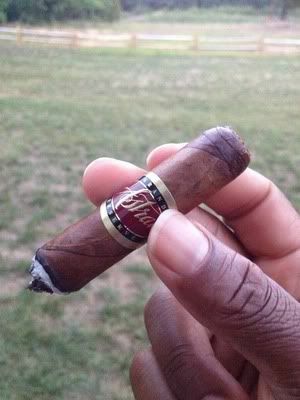 Sweetness of chocolate still coates my mouth from this cigar. Vegetable and sweet leather flavors is what I got from this and on each pull a mild spice. The burn was razor sharp, I was impressed also by how long the ash held. The cigar was packed tight and the ash was a solid gray all around. It was not big on smoke. Overall, for this being my first one ever smoked outside of a Cuban Trinidad. I have to say it was really flavorful and tastey. 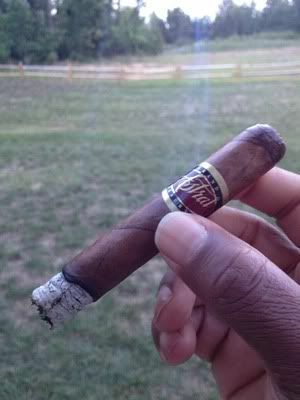 Had this in my humidor since September 27th when E gave it to me. Thanks again ENFIDL. 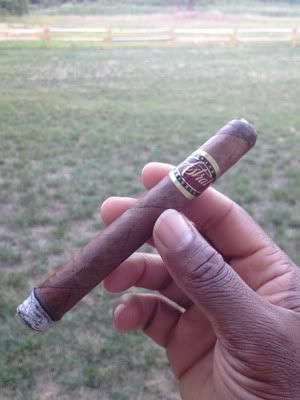 I did a little scouting around to see what others thought of this cigar. There is a bunch of mixed reviews on it. Which tells me that it may be a inconsistant cigar. Even with saying that. It's nothing wrong with getting two or three of them and letting them sit for awhile. Then firing one up. If that first one is a no go. Let it rest a while and try it again before giving up on it. I also failed to mention that I keep all my cigars in my cabinet at 65% and in my humidors at 69%. I know this may sound wierd to some. But I rarely take one out of either and smoke them right then. Since I do most of my smoking in the morning. I usually have a cigar before work. That's why I usually have a corona or robusto. I'll grab three to five cigars that catch my eye on Monday and I'll put them in my travel herf a dor. I usually use a boveda 69% bag for humidification. I also have a thin sheet of spanish cedar in there. I don't know if that's over board. But that's how I do it. Great review Rick. Almost made my mouth water. Perfectly written and stated, WTG! And a big thank you for the read as well! nice review rick. and nice choice of cutter. looking back on it i should have gone with the xi3 redwood over the carbon fiber. Great review Rick. I want more! O yea Kevin I Think the carbon looks great on the xikar. carbon fiber looks great on anything. and yes it looks sick on the xikar, but being in the construction trade there is just something about the redwood that i love. Glad to hear you enjoyed it and that it inspired you to do a full review and write up on it brother! Great review and I look forward to reading more! Great job so far. I'm ready for review number 2! Sounds good, i will have to add this to my to try list. Reviews like this really help me find different sticks to try. MY History - Well, it's been a while since I last did a review. But this cigar got my attention. And guess what, it's a budget stick. That's right, every now and again something like this catches my attention. I wasn't going to smoke it. But I was compelled to by the luring appeal of the wrapper. I did my custom glance over my cigars in the cabinet and this one said it's time. This bad boy has been in my cabinet since I got it up and running. Before that, the bundle sat in my cooledor for about six months. It has been in there a total of a year and half un touched. I got it by listening to Tim. That's right The Beard got me. Pennies for a bundle, I can't remember. 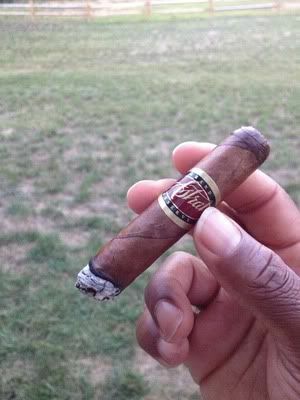 But what I do remember is him(Tim) saying something to the fact that this cigar is toasty with a bread like flavor. From that, I knew I had to try it. Anyway, when I got it. I also got a few other things and this one never got touched. Nice review and it makes me want to try one. Nice review Rick. I scored a box of these soon after I first arrived to the forums. These were the same sticks only in glass tubes. 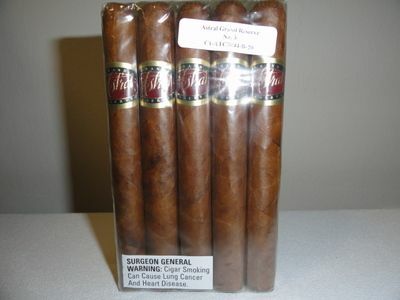 I agree with everything you said and for a mild stick they are very flavorful. Mt palate has changed completely since those days but I remember those as great sticks. Thanks Brett, appreciate your input. Will probably try to do another this weekend. Thinking about doing a CroMagnon Anthropology. Just depends if I'm in the mood for it then. I had one a week ago and it was pretty good.